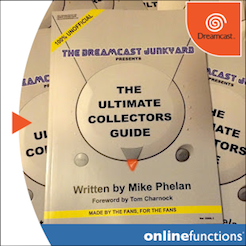 With the creation of 'The SG-1000 Junkyard', I've had my mind on Sega's first console as of late. Members of our Facebook group may have seen that I recently posed a question to our members: which Sega series appeared on every single Sega console? 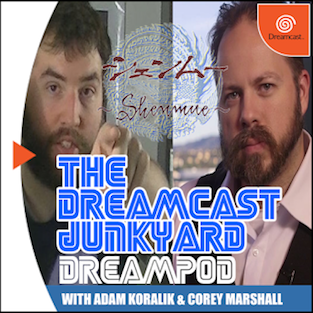 The short answer is none, but there were a number of games, series and characters that appeared on both the SG-1000 and the Dreamcast, so I had the bright idea of setting up a comparison of sorts for shits and giggles, while also shamelessly plugging our new website. 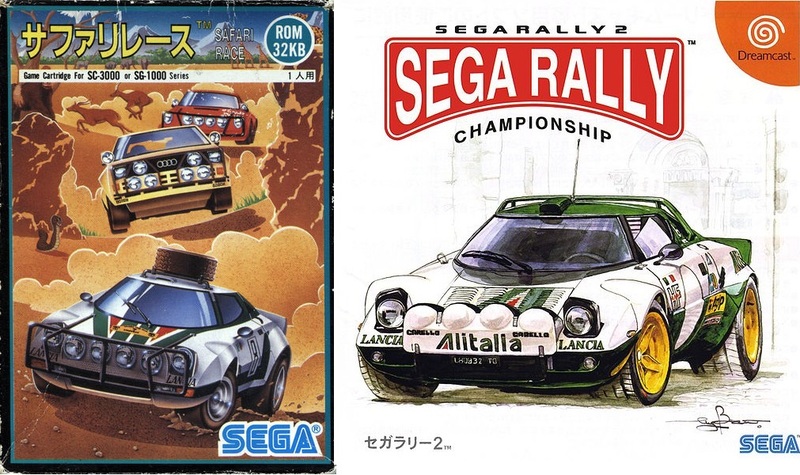 While not one of the starting cars in the original Sega Rally, the Lancia Stratos is famous for being the faster but less wieldy unlockable car in the subsequent Saturn port. 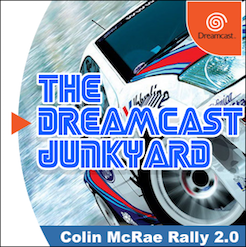 As all good Dreamcast fans should know, it graced the cover of Sega Rally 2 in all regions. 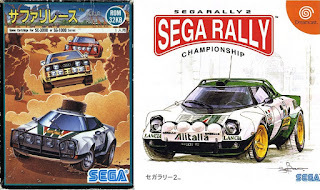 What's less well known however, is that the car was licensed to a game much, much earlier in Sega's history. Unfortunately, no rhinos are featured as hazards in Sega Rally 2. Unlike Sega Rally, Safari Race wasn't a port of a state of the art arcade game, but instead a simplistic 8-bit racer released exclusively for Sega's first console. In the game, the player must drive along a desert track avoiding other cars and wild animals, while paying close attention not to run out of fuel by periodically stopping at petrol pumps to refuel. Chack'n Pop was an early Taito single screen 2D platformer with the unique mechanic of the main character being able to switch between walking on the floor and ceiling. It was originally released into the arcades in 1983 but two years later received a fairly faithful (for the time) SG-1000 port. Awww, what a cute little cursor Chack'n makes. The game features characters that would later on become mainstays of the Bubble Bobble franchise. In fact, it is often considered a spiritual precursor, and many people consider it part of the Bubble Bobble franchise itself. While not a playable character in Puzzle Bobble / Bust-a-Move 4, he (how dare I assume Chack'n's gender), does make an appearance in the form of the cursor on the main menu screen. 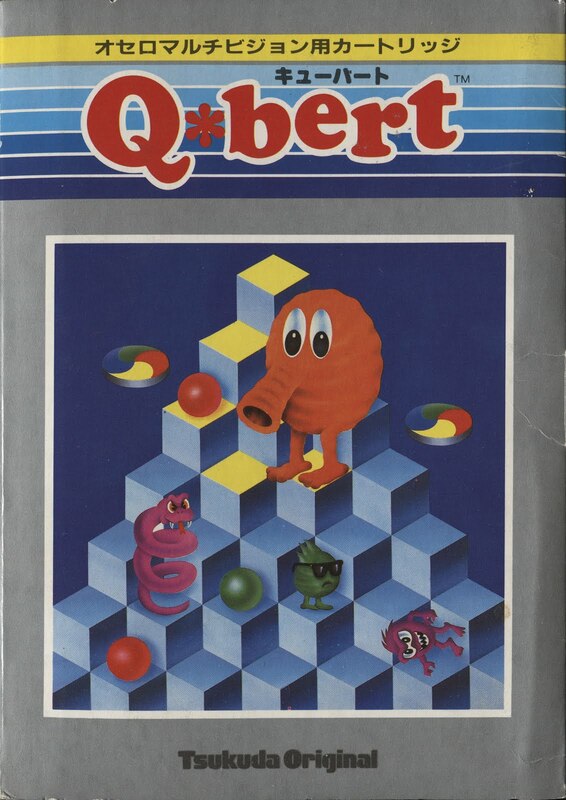 As Scott quite cleverly noticed, if Chack'n Pop is considered part of the Bubble Bobble franchise, then we could say that it was perhaps the only (*read on to learn more*) series of games to feature on all six Sega consoles. How cool is that? I wont patronise you with an unnecessary introduction, we all know Hang-On. What's unusual about the SG-1000 port is that it was released as Hang On II despite, with exception of the downgraded audio and visuals of course, being all but identical to the Master System's version named simply, Hang On. While not a patch on the arcade original or even the later Megadrive port of Super Hang-On, it's more than playable and does a great job of recreating the arcade action on vastly inferior hardware. It took fourteen years for Sega fans to get an arcade perfect port of Hang-On. 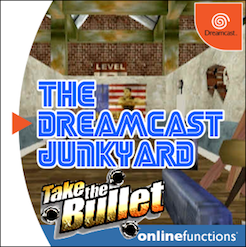 The Dreamcast version is a close to identical port of the original arcade game and thus infinitely superior. The Hang-On bike and rider also make an appearance as a run of capsule toys within the game. Left: Hang On capsule toy. 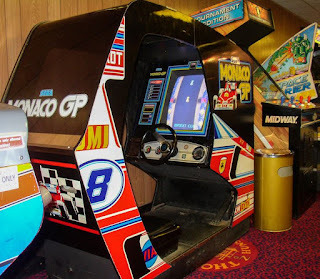 Left: Hang On arcade machine. It could be argued that Hang-On is the only Sega franchise to feature on every Sega console. 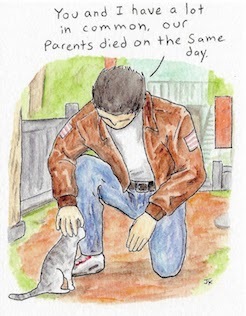 Unfortunately, the weak link comes in the form of GP Rider. While the arcade original of GP Rider had little in common with Hang-On, other than being a game about racing bikes, the Game Gear port bears a striking resemblance to the SMS and Game gear releases; not only does it play and look like a Hang-On game, but many of the sprites are ripped straight out of other games in the series. Way before Q*Bert starred in such cinematic classics as Pixels and Wreck it Ralph, he was a humble video game character synonymous with the arcades in the 80's. 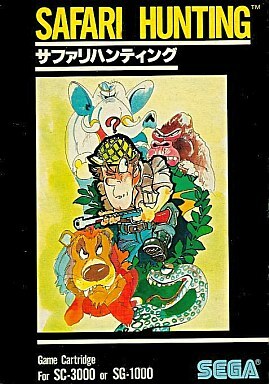 A port of the game was brought to the official Tsukuda Original clone of the Sg-1000, the Othello Multivision. Although not an official SG-1000 release, due to the Othello Multivision being identical to the SG-1000 at a hardware level, the game is completely compatible with Sega's System. While nothing special, for the time it was a competent little port and is one of the only unlicensed SG-1000 titles worth picking up in my opinion. 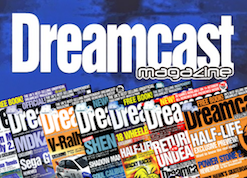 The Dreamcast version was a re-imagining of the game that added extras such as a story mode. To be honest, I've not played it myself, but the reviews were pretty negative at the time. This one's a bit of a cheat to be honest. You see the Dreamcast's Monaco Grand Prix has absolutely nothing to do with Sega's series of Monaco games. It was created by Ubisoft and is actually a member of the Racing Simulation series. Still, for the sake of completion, I've included it here. Left: Monaco GP. Right: Monaco Grand Prix. The SG-1000 release is yet another adequate port of Sega's antiqued arcade racer. 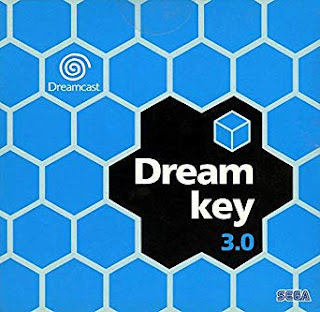 If I'm completely honest, it hasn't stood the test of time as well as some of Sega's other early arcade games, but is worth loading up and giving a go out of curiosity. The SG-1000 port of Flicky is one of the more impressive games on the system from a technical standpoint. The scrolling is some of the smoothest seen on the system, but unfortunately, something about the collision detection makes it incredibly difficult when compared to its arcade and Megadrive siblings. 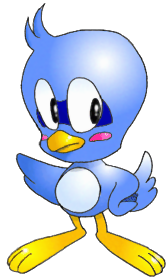 While Flicky wasn't lucky enough to receive his own game on the Dreamcast, he did make an appearance in Sonic Adventure albeit with the rather disrespectful name, "Birdie". It's been a few years since I've played Sonic Adventure, but if I remember correctly, him and the other Flickies (*that's gotta be the plural form of Flicky, right? 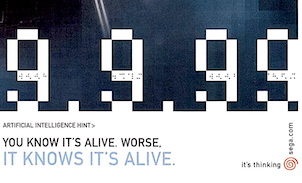 *) were brainwashed and used as symbiants for the E-100 series of badniks. Somehow Flicky escapes and for whatever reason is carrying a chaos emerald... or something like that...then Eggman tries to take it yada, yada, yada... whatever, he's in the game. 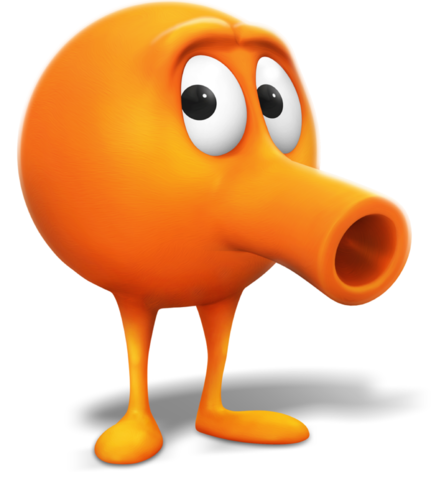 Due to Flicky's regular appearances in the Sonic series, he happens to be the character that has appeared on more Sega systems than any other. 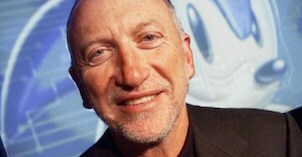 Not only did he appear on the six main Sega consoles, but also the two Megadrive add-ons and even the Sega Pico. The only system in which he's absent is the Pico Beena *Damn! So close!*. There's some Sega trivia for you! I'm sure many of you know of Tranquillizer gun as the old fashioned game on the menu of Dynamite Cop that let's you build up extra continues to be used to help progress through the main game more easily, but almost two decades before that it was a mediocre arcade game. Don't worry. It's only a Tranquilizer Gun. Due to the game already being a few years old by the time it got ported, and hardly being cutting edge at the time of release, the SG-1000 port makes an admirable effort at bringing the game to the home console. 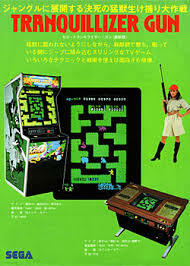 The original was a vertical screen release, so rather than have large boarders on each side, the port simply rotates the maze 90° without effecting the gameplay. One of my all time favourite pieces of box art. Just look at that, pure brilliance. The unlockable game within Dynamite Cop on the other hand is an identical port and therefore retains the original aspect ratio while adding some nice looking trees as the boarders for extra effect. It's far from a classic, but another game from Sega's distant past that's worth checking out. The game deserves bonus points for being about a dude going to Africa to hunt wild animals. That's a theme you'd certainly never see in a mainstream game in 2018! 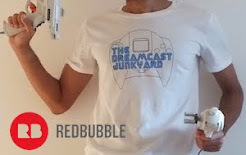 I imagine it was a bit of a controversial subject even in the 80's, which is probably why they put so much effort into presenting the weapon in the game as a 'tranquilizer gun' (*Yeah right Sega, you don't fool me!*). Last but not least, Galaga! According to Sega Retro, Sega Galaga is the only version to have received a name change. Why this is the case, I couldn't tell you for sure, but it was quite common for Sega to license arcade games from other companies and port them themselves to their early systems. 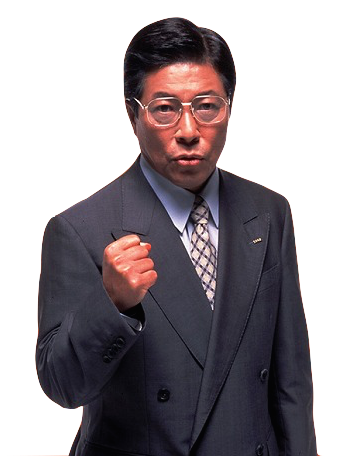 Perhaps it was Nintendo's influence dissuading developers to make games for other consoles, or perhaps it was just easier for the likes of Namco to simply take a paycheck and leave the rest to Sega. Either way, it's a great port of an arcade classic. As with Safari Hunting above, the screen has been rotated to accommodate 4:3 televisions thereby shortening the distance between enemies and the player which can make the action feel a little cramped, but other than that, no complaints from me. 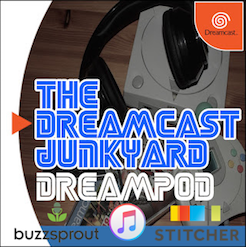 What can be said about the Dreamcast version? 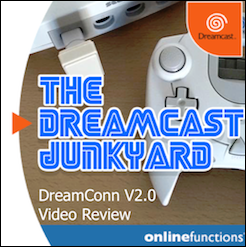 Well, it's no surprise that the Dreamcast manages to emulate the original arcade game perfectly (at least to my eyes). Other than that, it's part of a compilation disk with a bunch of other Namco classics including the sequel, Galaxian. At the time of release, I'm sure it seemed like a rip off, but as of now you can pick it up cheap or burn it for free. 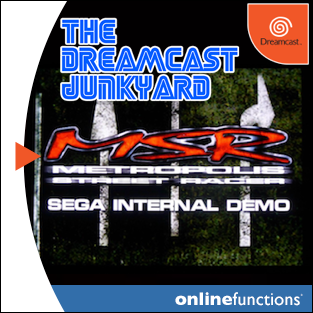 Why you'd want to play the game on Dreamcast over the host of other systems it's available on, I couldn't tell you. Thanks for reading. 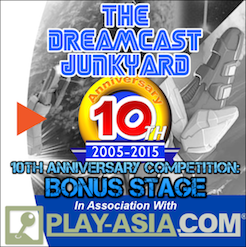 If you'd like to learn more about Sega's first console, the SG-1000, please check out the SG-1000 Junkyard. nice one Ross that was really cool!